U.S. Pacific Blue Whales Seen Rebounding Close To Historic Levels : The Two-Way With their population estimated at roughly 97 percent of historical levels, blue whales off the West Coast are being called a conservation success story. 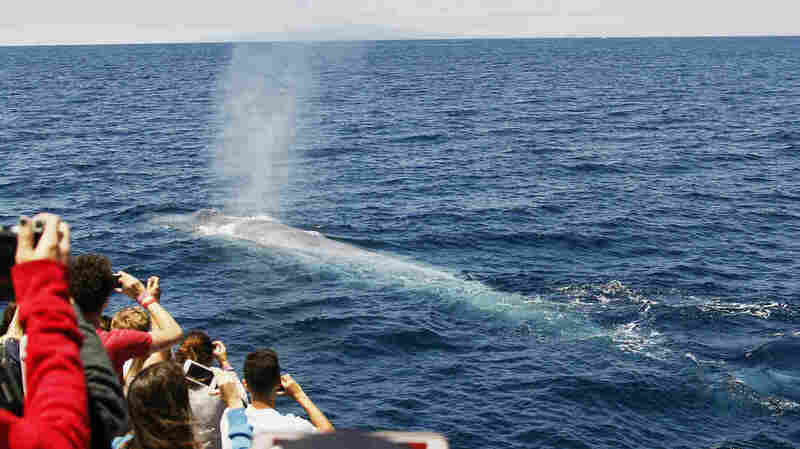 Off the coast of Southern California, a crowd watches a blue whale rise to the surface earlier this summer. A new study says the population of blue whales off the West Coast is close to historic levels. Decades after the threat of extinction led to them being protected from whalers, there are now about 2,200 blue whales off the West Coast, according to a new study. That's roughly 97 percent of historical levels, say researchers at the University of Washington who call their findings a conservation success story. "This is the only population of blue whales known to have recovered from whaling," according to a university news release, "blue whales as a species having been hunted nearly to extinction." The scientists say the population of California blue whales was never as large as many of those elsewhere on Earth, citing research that shows that whales in the eastern Pacific Ocean are distinct from those in the western Pacific. California blue whales swim in waters from the equator up to Alaska. The new report is coming out months after the same research team studied the damage done to the same blue whale population from 1905-1971. They say the gains off the U.S. coast show that blue whales, the huge animals that have often been used to promote wildlife and environmental protections, can rebound elsewhere, as well. "The recovery of California blue whales from whaling demonstrates the ability of blue whale populations to rebuild under careful management and conservation measures," said study lead author Cole Monnahan, a doctoral student in quantitative ecology and resource management. The researchers believe that a rebound close to historic levels might explain the whales' recently slowing population growth better than theories that blame deadly strikes by large ships. They suggest that the animals' large size — they can reach nearly 100 feet in length, and can weigh nearly 200 tons — might limit their population density. "Our analysis suggests that while current levels of ship strikes are likely above legal limits, they do not immediately threaten the status of the ENP blue whale. This conclusion is based on the log-linear model which suggested the population has likely increased since 1993 (despite ship strikes), and from the theta-logistic model, which found this growth has slowed due to density dependence, not ship strikes." But even if the study's new data are confirmed by further research, "there is still going to be ongoing concern that we don't want these whales killed by ships," says study co-author Trevor Branch, assistant professor of aquatic and fishery sciences. The University of Washington study was funded in part by the National Oceanic and Atmospheric Administration, through the Joint Institute for the Study of the Atmosphere and Ocean.